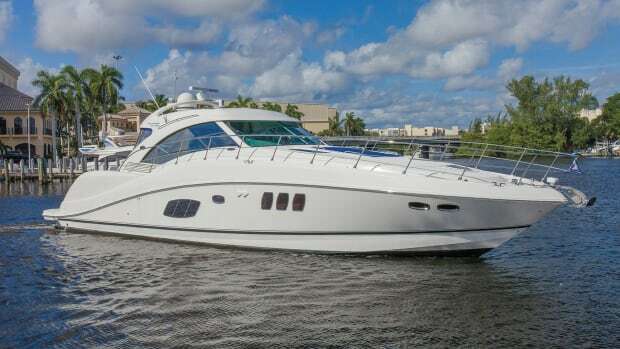 That’s a Sundancer,” said a sweet guy to his wife as he led her along a dock at the Miami boat show. 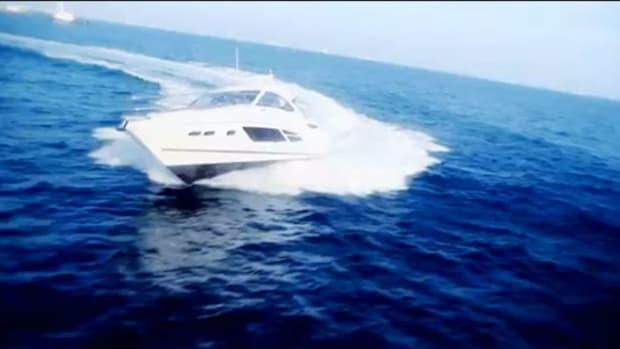 She looked impressed by the big express cruiser, even though it wasn’t a Sundancer, or a Sea Ray for that matter. The guy made a common mistake. 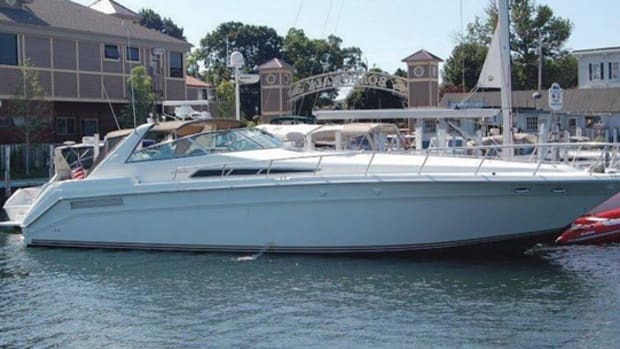 After all, the Sundancer series that debuted in the 1970s dominated the family cruiser segment for decades and became the brand that many people associated with express boats in general. But the Sundancer has changed in recent years. 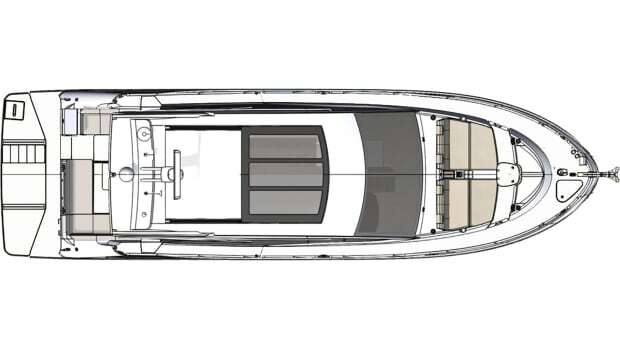 It’s morphed from a design that put entertaining areas belowdecks to a coupe-style platform, with the salon and galley up on the same level as the cockpit. 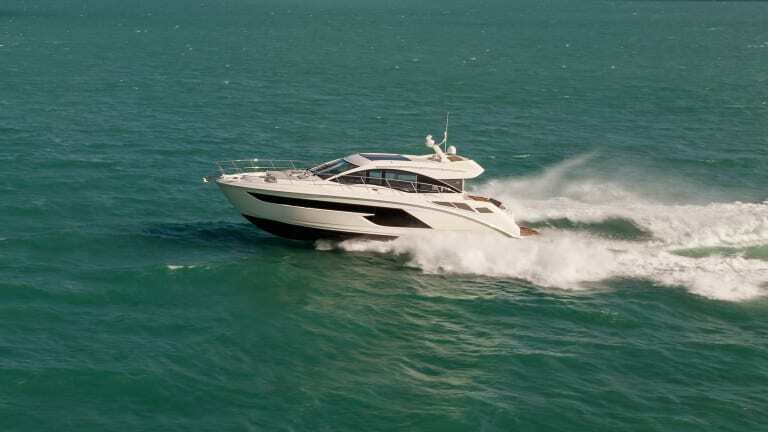 In Miami, Sea Ray debuted an addition to the series, the 520 Sundancer, and it looked to be one of the line’s most polished models to date. 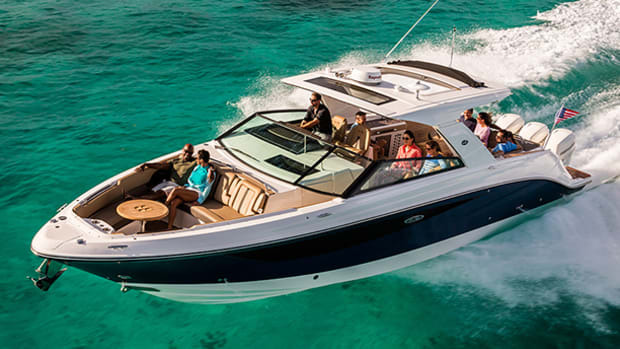 “We thought a lot about how to infuse the interior with natural light,” said Ron Berman, Sea Ray’s vice president of product portfolio. 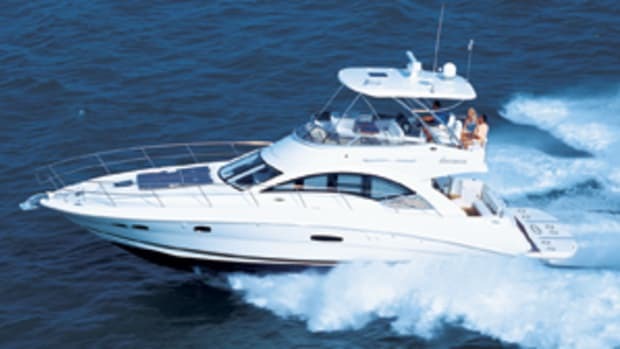 In the end, the builder brought in the sun with a four-panel Opacmare sliding salon door (many other boats in this size range have just two or three panels), oversized deck windows and a sunroof with glass that Berman says reduces heat transmission by up to 40 percent. That sunroof, by the way, is standard. 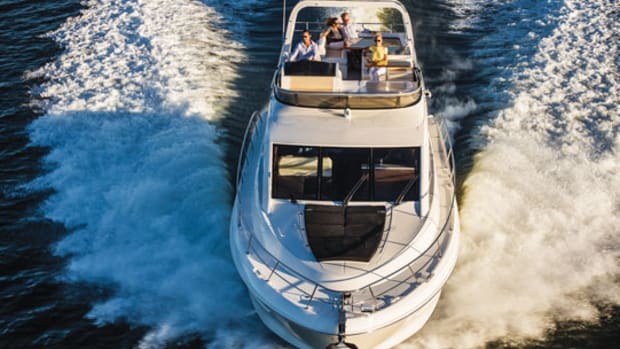 It’s one of a number of features owners won’t have to pay more for, which is good news if you’re in the market for a turnkey cruiser. 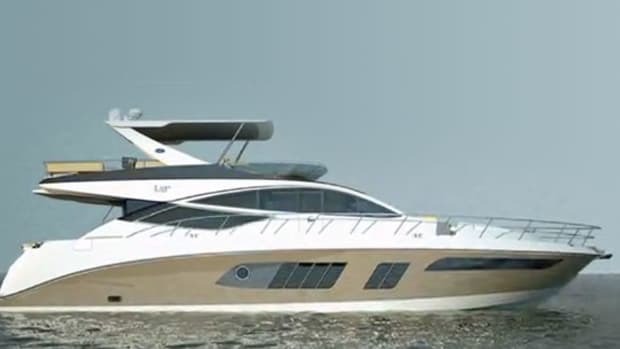 This cruiser is based on the same variable deadrise hull that supports the builder’s 520 Fly, which splashed in late 2017. 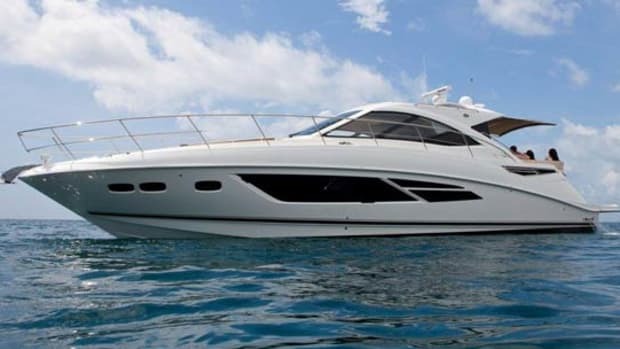 The 520 Sundancer is home to two staterooms (a third is optional), and a few interesting features that will improve the cruising experience, even if only in subtle ways. 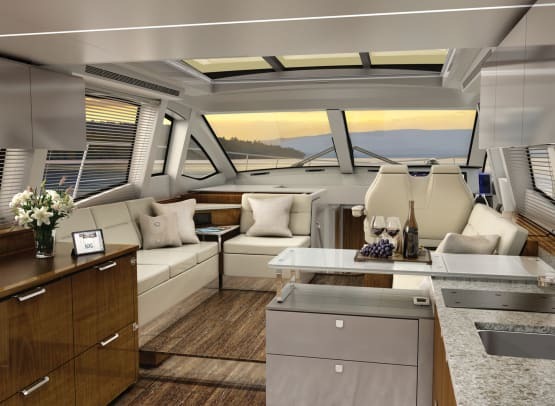 One is in the cockpit, where you can get creative with the conversation pit as convertible lounges and an adjustable table allow for at least three different setups—it’s kind of like moving furniture around in your family room, only a lot easier. 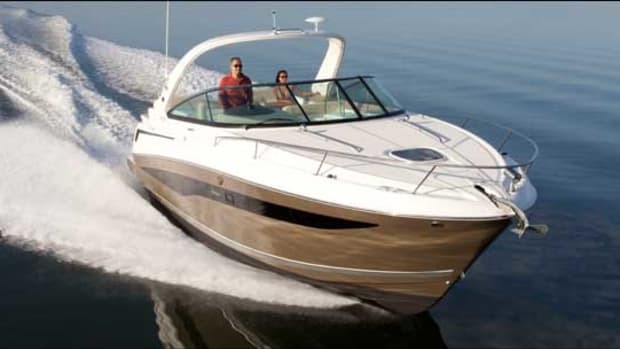 It’s the type of arrangement Sea Ray has always done well, even if the effort isn’t always recognized by those happy couples at boat shows.